LOUISVILLE, Ky. (WDRB) – As the cars cross over the Ohio River and the days go by, the Clark Memorial Bridge gets a bit more yellow, a bright pop of color against a blue sky. The color decision was made back in 2010 by a design team with the Waterfront Development Corporation and Downtown Development Corporation. “They were really trying to relate it to Whiskey Row and try to get sort of a hue that was very warm and sort of related to bourbon in that sense of warmth,” said Rebecca Matheny, Executive Director of the Louisville Downtown Partnership. It was part of a Second Street revitalization plan as the KFC Yum! Center was being built. That yellow color actually popped up in 2010 on the Kentucky approach to the bridge. Then the Indiana approach was painted three years later. Now, the full bridge is being painted in 2018 after years of other construction. 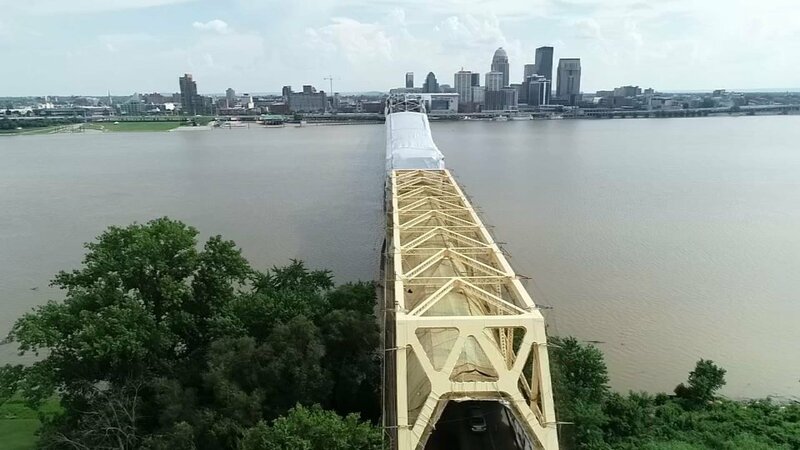 “We didn't want to have lane closures on the Clark Memorial Bridge during construction of the Ohio River Bridges project,” said Andrea Clifford with the Kentucky Transportation Cabinet. The bridge is currently reduced to one lane in each direction for the painting. It will stay that way for about a year and a half. “The reason it takes so long is, one, you have to blast clean the rust and the other debris," Clifford said. "But No. 2, there's a lot of lattice work in the steel on the Clark Memorial Bridge. It actually has more surface area than the steel on the Kennedy Bridge." Because it's a unique piece of infrastructure. It could become a noticeable staple of the Louisville area. “Having it be bright and having it stick out, it's going to be neat to see it when you're downtown," Matheny said. "It's going to be neat to see it when you're driving on the freeway. It's going to be great to see it when you land from a plane, just to sort of celebrate that structure." The bridge is expected to be fully yellow and reopened in November 2019.